Can I make my downloaded videos private, so no one else can see them on my computer or devices? Yes, if you have purchased RealPlayer 18 Plus, or have an active subscription to RealTimes Premium or Unlimited, you can make videos private when you download them with RealPlayer. To see and play these videos, you will need to enter a PIN (personal identification number). Note: Make sure you have updated to the latest version of RealPlayer Plus (18.1.5.694), released on August 31, 2016. Sign in with your paid (Plus, Premium, or Unlimited) account. 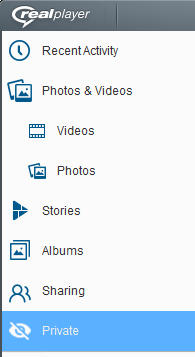 Allow RealPlayer to update (if requested) and make sure that there's a star beside your username. Click Private in the sidebar to go to the Private view. Click Enter PIN. Fill out the form. The PIN needs to be between four and six numbers long. Your PIN will be ready to use. If the RealDownloader window is open, close it and reopen it to activate the Make Private buttons. When the video download is complete, click Make Private beside the video name. The first time you click Make Private, you will be asked to enter your PIN. Your PIN will stay active until you close RealDownloader, lock your computer, or let your computer go to sleep. Select a video or videos in your Library. Right-click and select Make Private. 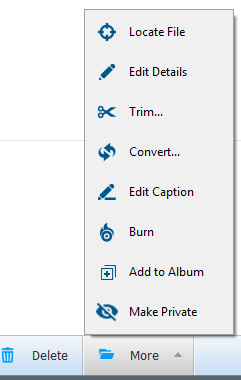 OR On the taskbar, click More and select Make Private. Click Private in the sidebar to go to the Private view. Click Enter PIN and enter your PIN. 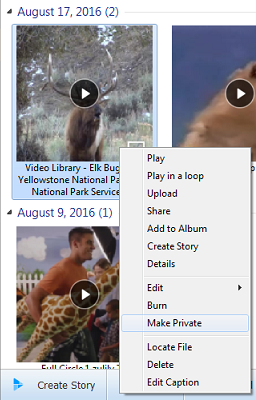 Your Private videos will be available to play like other videos in your Library. You only have to enter your PIN once per viewing session. Your session lasts until you close RealPlayer, lock your computer, let your computer go to sleep, or click the End Session button in the Private view of your RealPlayer Library. In a Private session of RealDownloader, you can change your mind. If you click Make Private, the video will be Private and the button will change to Undo Private. Clicking Undo Private will restore the video to the Videos view of your Library and change the button back to Make Private. Select the video or videos. Click Undo Private in the taskbar. OR, right-click on the video and select Undo Private.